Clinton Lylvieve is a Breton child living in Dragon Bridge. He is the son of Azzada and Michel, and brother of Julienne. He wants to be a soldier, although he is too young, and spends most of his time "patrolling the town", accompanied by his pet goat Lucky. 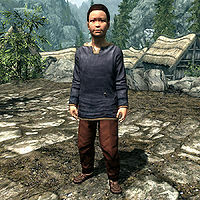 Clinton wears blue colored child's clothes and a pair of shoes, and is equipped with a simple iron dagger. He carries a key to the family's house, a selection of food and toys, and a small amount of gold. Clinton will be quick to ask you if you are a soldier: "Are you a soldier? One day, I'm going to be a soldier!" He will then tell you about what he is doing to help protect Dragon Bridge: "Pa says I'm too young to fight in the war, but I can still help by patrolling the town." Clinton seems to have an understandably naive image of what the life of a soldier is like, as he will often tell you: "I wish I was a soldier! They get to travel and stay up late and have fun!" He may also talk to you about his pet goat, Lucky: "Have you met Lucky? He's my pet goat, and he helps me patrol the town." If you ask him about the Moth Priest during the related quest, he will be excited to share the information with you: "I don't know what a Moth Priest is, but I did see an old man in a robe not long ago. He was riding in a wagon with some Imperial guards. They didn't stop to visit, though. They rode through town heading south, and went across the big bridge. It was only just a little bit ago. I bet you can catch them if you hurry up." This page was last modified on 21 April 2019, at 04:48.